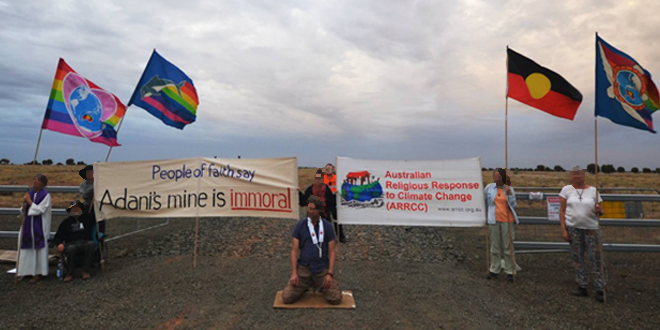 Adani protesters: Police charged five multi-faith protesters and served others with infringement notices on November 21 as a group blocked work on the Central Queensland rail line to be used to transport coal from the proposed Adani mega-coal mine. Police charged five multi-faith protesters and served others with infringement notices on November 21 as a group blocked work on the Central Queensland rail line to be used to transport coal from the proposed Adani mega-coal mine. The protesters, including those charged with blocking road access and due to appear in court in early December, are all members of the Australian Religious Response to Climate Change, a multi-faith organisation that works with diverse faith communities to tackle global warming. One protester is a member of the Brisbane archdiocese’s Catholic Justice and Peace Commission. During the election campaign, the CJPC urged parties and candidates to halt plans to develop the Carmichael coal mine in the Galilee Basin and “listen to the cries of the earth”. “It is already experiencing significant damage due to the effects of climate change and will face much worse unless we commit to urgently reducing carbon emissions so that the global temperature rise might be limited to less than 1.5 degrees,” the CJPC said. “We specifically urge the churches to continue to campaign to stop Adani. “Far from ignoring the cries of people in regional Queensland where unemployment is high and the economy is struggling, we encourage our politicians to respond to their legitimate needs for the dignity of work. “We believe that the next Queensland Government, with all the resources available in the public service, in business, in academia and in the community, can find ways to develop a carbon-free future for their regional communities.